Jalandhar: With an objective to promote innovation and to generate consciousness towards environment friendly mobility solution to global society, Lovely Professional University (LPU) & Maruti Suzuki hosted national green mobility competitive event ‘Efficycle-2017’ at LPU campus. Out of 64 participating teams from across the country, the team ‘Velociracers’ of College of Engineering Pune (COEP) lifted overall trophy of the competition and also won first cash prize of Rs One lakh. LPU engineering students’ team ‘Illuminati Racers’ has won the best design award. It was very unique to see that an all girls’ team from Indira Gandhi Women College of Engineering & Technology (New Delhi) competed neck to neck with their male counterparts and won the consolation prize of the competition. In all cash prizes worth Rs 7 Lakh and certificates were distributed to winning teams in different categories of the competitions. Of these, 15 winning teams or individuals were awarded cash prizes from Rs 10,000 to Rs 30,000 each for the Best Design, Innovation, Marketing Presentation, Acceleration, Light Vehicle, Built up Quality, the Best Girl-Student participant and more. 200+ LPU student volunteers and 50+ judges and mentors from the top automotive industry co-ordinated for smooth conduction of 5-day mammoth event. The event was supported by Maruti Suzuki India Ltd (MSIL), Indian Oil Corporation, ICAT and Society for Automotive Engineering-Northern India Section (SAENIS). Executive Adviser MSIL Mr I V Rao (Chairman- Engineering Education Board & Vice-President SAE INDIA); LPU Chancellor Mr Ashok Mittal; Site Head ICAT (Manesar) Mr UD Bhangale (Convener- SAE NIS Efficycle 2017); Pro Chancellor Mrs Rashmi Mittal; and, GM MSIL Mr Jitendra Malhotra (Co-convener, SAE NIS Efficycle 2017) and more had specially graced the occasion. 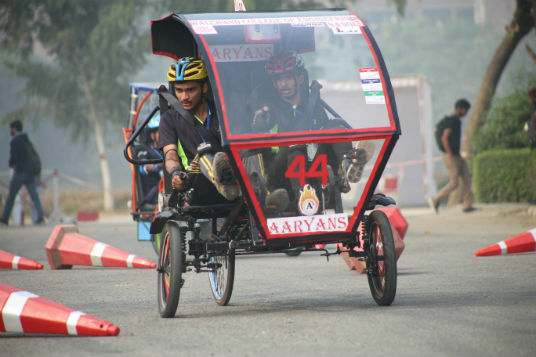 The coined word ‘Effi-Cycle’ has been derived from ‘Efficient-Cycle’ which provides engineering students an opportunity to conceive, design and fabricate a three-wheel configured vehicle powered by human-electric hybrid power. It is capable of seating two passengers catering to the day to day mobility needs. The aerodynamically designed vehicles are engineered for the best green performance & safety.